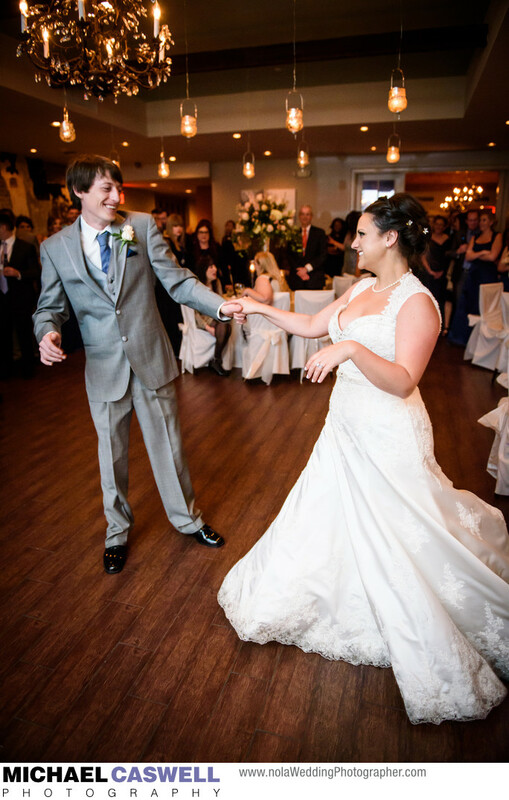 This lovely bride and groom flash broad smiles at each other as they enjoy their first dance at Hotel Mazarin's elegant La Louisiane reception space. The wedding ceremony had taken place out in the hotel's beautiful French Quarter courtyard, followed by a second line through the streets. I love photographs like this one that so wonderfully capture a happy and emotional moment. Receptions at this venue, which was previously called the Saint Louis Hotel, used to be held in the courtyard as well. But an extensive renovation a few years ago produced this very nice indoor space which is used for most of the wedding receptions and other events instead of the courtyard, and it has turned out to be a wonderful combination. The gorgeous decorations for this event were created by Bee's.